Good morning! First let me apologize because I've been such a bad blogger lately. Usually I try to catch up with commenting etc. over the weekend, but this weekend I was away and couldn't do it. Then over the last couple of days I was catching up on all the paper work at my job. I went to Czech (we visited Prague and some other places) for the weekend and I have to say that Prague really is as beautiful as they say. I love all those old buildings. If you get the chance, you should visit it. 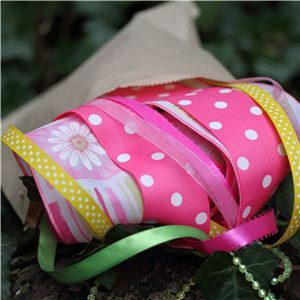 We still have a "pink and green" challenge going on at Crafty ribbons challenge blog and if you haven't already, go and enter your creation(s) - you still have one week to do this. You might get lucky and win this wonderful prize. I used the leftover pieces of Prima's Tea Thyme paper pad. The papers in this paper pad are gorgeous - I really need to get another one. I unked the edges with my black ink pad. I used several different dies - the swirl is a sizzix die , the flowers are made with TH tattered florals die and the die cut behind the butterfly was made with my Spellbinders' die. The flower border was made with my craft punch. I inked the bigger flower with TH antique linen DI. For the center of the flower I used a gold sequin (same one that I used on the swirl and for the center of the flower ribbon) and then covered it with a white pearl from my stash. The butterfly was stamped on white cardstock with Memento rich cocoa ink pad and then I covered the white parts with Rayher glitter glue. I also used the gorgeous white french rose ribbon and the fab olive lace from Crafty ribbons. I hope you'll come and play with us. Gorgeous card Cebelica, the design and papers are fab. Diese Karte gefällt mir aber sehr gut. So soft and pretty Cebelica - I love this! gorgeous card with a beautiful butterfly....thanks for playing with us at Divas by Design!